Hector Downie married Elizabeth Jane Barry, widow of Archibald Johnstone, a doctor in the colony. Downie became an army captain, later lived in Rothesay, and died there on 8 November 1844. [PROB11/2008/f351 Will of Hector Downie Esq; Caledonian Mercury Thu 21 Nov 1844 page 3]. Murdo Downie [1768-1818] came to Guiana as a land surveyor in 1802. He was probably Hector's older brother, born in 1768. According to Peter Fairbairn, writing to Lord Seaforth, Murdo's prospects were not good and he went to Trinidad [NAS GD46/17/21]. He was back in Demerara by 1806, running a store in Stabroek. In 1808 he sold the business as returned to his profession as a land surveyor. [Essequebo & Demerara Gazette, various editions.] He made a donation to Inverness Academy of ten guineas in 1814. 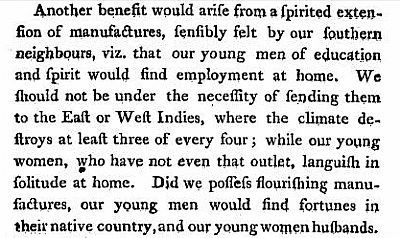 In May 1816 he left the colony, accompanied by one servant (presumaby a slave), and died in Barbados in 1818 [Gentleman's Magazine]. Murdo had ealier established himself as a writer (lawyer) in Dingwall, where in 1795 he married Mary Grant, daugher of Dr Robert Grant of Inverness. A son was born in November 1797 but Mary died a year later. On 21 December 1799 Mary's sister, Ann, gave birth to a male child, which was clearly Murdo's. The baby was put in a basket, left on a doorstep, and later died. Murdo was tried and acquitted of murder but convicted of conspiring to expose an infant child, and served 9 months in the tolbooth of Inverness. [NAS JC26/1800/16 & HO 47/25/39] He had married Ann, in London, although a marriage to a deceased wife's sister was illegal. He had every reason to leave the country for Guyana. John Downie [c1800-53] became the principal judge of British Guiana in 1844 [London Gazette Issue 20394 page 3519]. He appears to have been related to Hector and Murdo since, in his will [PROB 11: Quire Numbers 501-550], he left money to the children of Rev Charles Downie, minister of Urray, who was a nephew of Hector, Charles and Murdo. In 1850 John Downie resigned his position and left the colony after he was accused of being the author of an anonymous attack in the press on the attorney general of the colony. [Guiana Morning Chronicle Thursday 26 December 1850 page 3]. Thanks to Ian Downie for his help with Downies in Guyana. Another brother of Hector and Murdo, Alexander [1765-1820], became parish minister of Lochalsh and his oldest son, John [b1797] 'attended college and then went to the West Indies' [Donald Sage, Memorabilia Domestica, Ch XIV].